The Sinks Canyon Rough and Tumble Trail Runs start and finish in beautiful Sinks Canyon, the corridor to Wyoming's Wind River Mountains. You can expect scenery that includes wildflower heaven, snow and ice covered peaks, deep canyons, enormous views, and fun trails. This race is hosted by the Lander Running Club, an inclusive, community-based organization for and by runners. Join us for a fun, and challenging, day of running some of the West's premier trails. The 50K course is a legit mountain run. If you like to play hard in the mountains this is the run for you. Here is the route: from Bruce’s parking lot enjoy the wildflowers of the mellow Sinks Canyon/River Trail until you get to the Sinks Canyon Campground. From there, cross the highway to a Climber’s trails and enjoy the steep climb to top of Fairfield ridge. 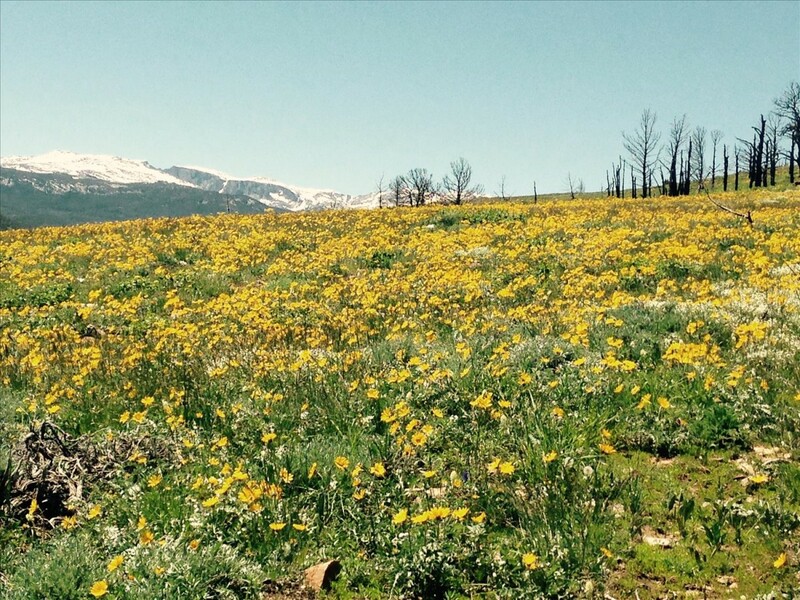 From the ridge, you’ll do a steep and technical drop down to Sheep Creek and up another two-track through a sea of wildflowers to the Timbertop Mountain. Turn left, and begin the ascent to Fairfield Hill. Enjoy the panorama of the Wind River Mountains in front of you as you traverse ridge on two track to Fairfield saddle. If you’re feeling groovy jump off the trail and quick bag the peak, the view is awesome. Tuck and roll off the Fairfiled saddle and head downhill back towards Sinks Canyon. After scooting around some mud on the road, don’t miss the right turn onto some fun single track back down to the bottom of Sinks Canyon. Cross the highway to Sinks Canyon Campground again and stay close to the river as you head back to Bruce’s Parking area (the start). Cross the road and begin your rocky adventure up the Middle Fork Trail. About 5.5 to 6 miles up the Middle Fork, hang a left, cross Sheep’s Bridge, and make the ascent to Worthen Meadows Reservoir. If you’re hot, take a quick dip before running on improved dirt road and a little bit of pavement before you get to Fossil Hill. Take a look behind you as you run for some of the best scenery of the day. After the Fossil Hill Aid Station, cross the cattle guard and turn left to begin your traverse around Fossil Hill through wildflower heaven on the Brewer’s Trail. Turn right on the Aspen Grade Trail to finish your descent and loop your way through the canyon back to Bruce’s Parking Area for the finish.